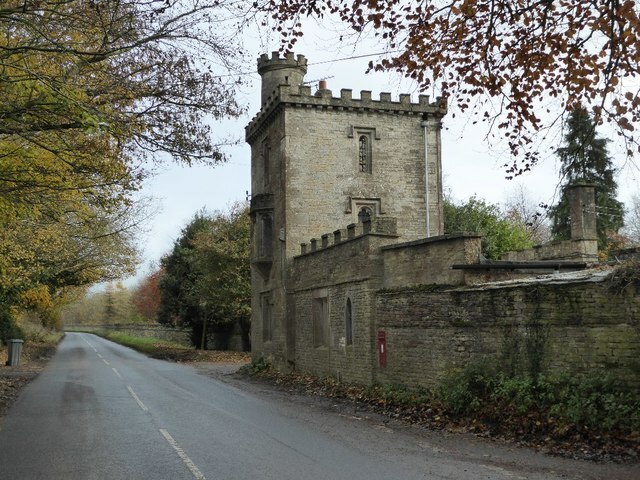 Lodge and gate to Lypiatt Park on Bisley Road. The lodge was designed by Sir Jeffrey Wyatville around 1820. The building is Grade II listed. Lodge house and gateway. c1820 by Sir Jeff-rey Wyatville for Sir Paul Baghott. Coursed rubble limestone with ashlar dressings. Three-storey tower with single-storey wing to west; attached gateway to east. Single-window fenestration to each face of tower. Canted middle floor oriel on north side with trefoil headed mullioned casements and crenellated top; 2-light with hoodmould to ground floor; similar on east side, both with trefoil-headed lights. Otherwise all windows to tower are single-lights, those to east and west sides on upper floor with rubble blocking. Machicolated and crenellated parapet; circular crenellated turret in north east corner. Crenellated parapets to single-storey wing; porch on south side of tower with pointed archway. Gateway has square cross-gabled piers, flanking walls having weathered coping, that on right with Tudor arched pedestrian doorway. Interior not inspected.